A todo el mundo le gustan los misterios. Resuelva uno en el campo científico y enseguida vendrán los elogios. What has been called “one of the most extraordinary outbreaks of poltergeist phenomena” of the twentieth century began with an English schoolboy, aged eleven and a half years, Matthew Manning. 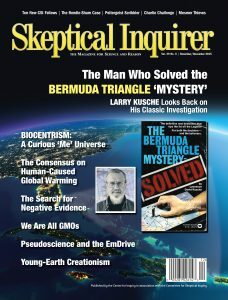 The man who solved the Bermuda Triangle “mystery” looks back after four decades on his investigations into the missing flight that started it all and the shoddy research, gullibility, and distortions that created this mystery. In 2013–2014, only four of 69,604 publishing climate scientists rejected anthropogenic global warming. The consensus on anthropogenic global warming is not 97 percent, as is widely claimed; it is above 99.9 percent. By their nature, paranormal claims depend not on positive but negative evidence, by which proponents attempt to use mysteries (“the unexplained”) to support their beliefs. In contrast, scientists seek to use positive evidence to solve mysteries.